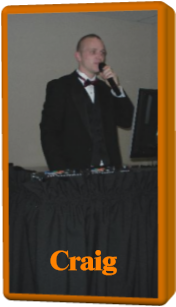 Stan's DJ Entertainment is a Personalized, Professional, DJ Service with customized music requested by you and your guests. The microphone introductions, announcements and presentation will see to it that YOU, the bride and groom, or guest(s) of honor, are the center of attention, not me, and you'll be congratulated throughout the entire evening. 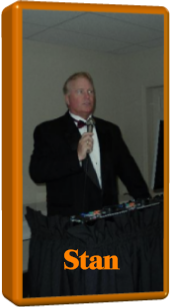 Whether you are planning a wedding, birthday or graduation party, or any other event, entertainment is a key ingredient to the success of your event. 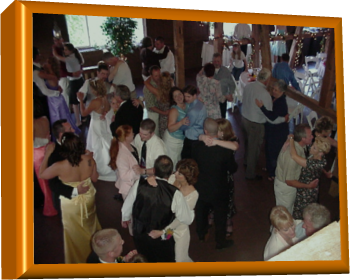 Stan's DJ Entertainment helps you host an event that will create memories to last a lifetime. We will motivate and move your crowd and with an extensive musical library (all on Computers and backed up compact disc, and additional computers) we guarantee we will have all of your favorite music, for all ages. We'll arrive at your location, wearing a tuxedo or appropriate dress, with an excellent, state of the art, mobile sound system and over 525,000 Dance Selections for you and your guests to choose from. Dance selections are always mixed in sets conducive to a full dance floor. There will be a wide variety of dance music to cover all the age groups present so that all will participate and have fun. Also ask about our prop packages like guitars, saxophones, Glo Products, costumes, and Village People hats or Theme decorations to add color and excitement to your events. The songs we play, and the order that we play them in, will determine whether a good time is had by all. We're there to create the mood for a party with the music we play, set the mood with the lighting, and provide professional microphone introductions and announcements, and that's what we do best. We'll work closely with your photographer and caterer also. With 43 years of experience in the Entertainment field as a Disc Jockey- Emcee, we take pride in our work and the excellent reputation we have earned. We enjoy seeing people have a good time, and the satisfaction that comes through knowing that we made the most important day of someone's life a beautiful one for them to always remember. We give the personal attention and preparation to each and every job we do. We'll meet with you to discuss your needs and preferences. We are listed in the Strathmore's Worldwide Book of Who's Who. Sit Back... Relax And Listen To Some Of The Great Song Selections We Have To Offer . 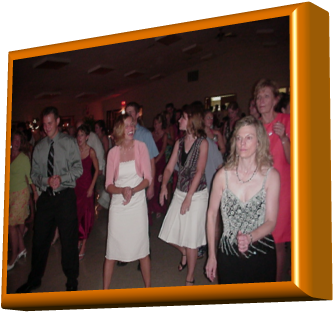 We Have Over 125,000 Songs In Our Inventory Including Everything From 50's-60's, Country, Big Bands, Polkas, Classic Rock, Top 40, Hip-Hop, Club, Dance, Disco, Dinner Music, To Wedding Ceremony Music And Much More. We Are Continuously Adding New Songs Every Month.